Greener Home LaundryFor the everyday items you wash at home, there are easy, earth-friendly solutions that will get your laundry greener and cleaner.All-natural laundry cleaning agentsThese tips are best for machine washable fabrics. Always test new laundry methods in an inconspicuous spot first.Vinegar Fabric softener: adding ½ cup white vinegar to the rinse cycle will soften clothes. For pillows and blankets, add 2 cups to the rinse cycle to keep them fluffy. Lint and pet hair prevention: adding ½ cup white vinegar to the rinse cycle will prevent lint build up on clothing and reduce the amount of pet hair left clinging after the wash Static cling: add ½ cup white vinegar to the rinse cycle to keep clothes static-free Hand wash: If you have trouble giving delicate items a thorough rinse when you wash them by hand, add 1 or 2 tablespoons of vinegar to the rinse water help dissolve detergent residue. Stain removal: diluted vinegar can be used on most machine-washable fabrics to remove stains. Our "stain smarts" posts for information on specific stains coming soon. 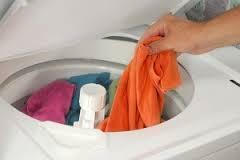 Color refresher: Soak faded clothes in a solution of 1 cup vinegar per 1 gallon warm water. Rinse in cold water and see the difference.Salt Bleeding: adding ½ cup salt to your regular wash cycle can help prevent colors from running or bleeding. Yellowing: For white cotton or linen items, a 1-hour soak in boiling water with 1 tablespoon salt and ¼ cup baking soda will remove the yellow tinge. For nylon, soaking in warm water with Epsom salt and rinsing in clear water will bring the white back out. Ironing: To clean a sticky iron, set it on low and run it over a piece of paper with salt spilled on it. And to keep the iron from sticking to clothes in the future, add a pinch of salt to the laundry starch. Baking Soda Odor eliminator: Adding ½ cup baking soda to the rinse cycle will neutralize odors and leave your laundry smelling fresh without fragrance. Brightener: To give your regular liquid laundry detergent a stain-fighting boost, add ½ cup baking soda to your regular wash cycle. Baking soda helps neutralize the pH in your wash water, improving the way detergent interacts with your clothes. Your whites will come out whiter and colors brighter. Stain removal: A paste of baking soda and water can be rubbed into tough stains like blood, wine, perspiration, and vomit to kill the odor and help remove the stain.Lemon Juice Bleach: Lemon juice is an all-natural bleaching agent. Pour lemon juice on stains (test for colorfastness in a hidden spot first) and hang in the sun to dry, then machine wash as usual. For an allover white brightener, replace the bleach in your wash cycle with 1 cup of lemon juice. Soak solution: For very soiled or perpetually dingy items (not just clothes—think towels, sheets, tablecloths), soak overnight in hot water with ½ cup lemon juice. Machine wash as usual. As part of our GreenEarth cleaning commitment to healthier homes, more laundry tips will be posted.